It’s been over a month since our last contributor interview, as we’ve been busy with the release of LibreOffice 5.2, but now we’re back – and this time we’re talking to Franklin Weng, who is active within the marketing and migration teams. What is your IRC nickname / nationality / location / family status? Two years ago I contributed in my spare time. Now I own a company providing consultancy, training and solutions with free and open source software (FOSS). Daily use of the software, and I had contributed some translations for the application and wiki as well. 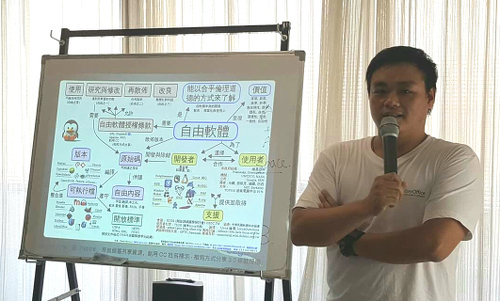 Then get I got more deeply involved when the government of Yi-Lan county and our National Development Council decided to migrate to the Open Document Format and LibreOffice starting in 2015. What areas of the project do you normally work on? Promotion, migration and training. I also cooperate with the localization (L10N) community in Taiwan. Well, I’ve been involved in free and open source software for more than 20 years, so it’s quite normal to me :-) Still, I’m quite happy to see the migration to LibreOffice in Yi-Lan succeed, and some departments in our central government and several county or city governments starting to go with us too. I edit plain text and write code with Vim (no, I don’t use an IDE). The reason? It should be because I’ve been been in love with Vim for more than 20 years. For office text files, LibreOffice Writer is my first choice of course. Sometimes I use LyX or LaTeX too. What do you do when you’re not working on LibreOffice? Any other hobbies you have? I work on other open source projects. Okay, and I also spend quite some time with my family and my boys. And I like baseball too. Thanks Franklin! Your efforts are very much appreciated. And to other potential contributors reading this: there are many ways to get involved with LibreOffice, from documentation and programming to translations and marketing. Join our community, gain valuable experience, and help to spread FOSS and open standards!